Normally the last thing I think about doing on a Sunday morning is whip out my laptop and write a post on the spot. I usually prefer having a few cups and coffee, cuddles and playing with my dog Ginger – after all we bloggers need a break sometimes ;-). However, yesterday was stuck in my brain so much that writing a fun post this Sunday was actually exactly what I wanted to do. 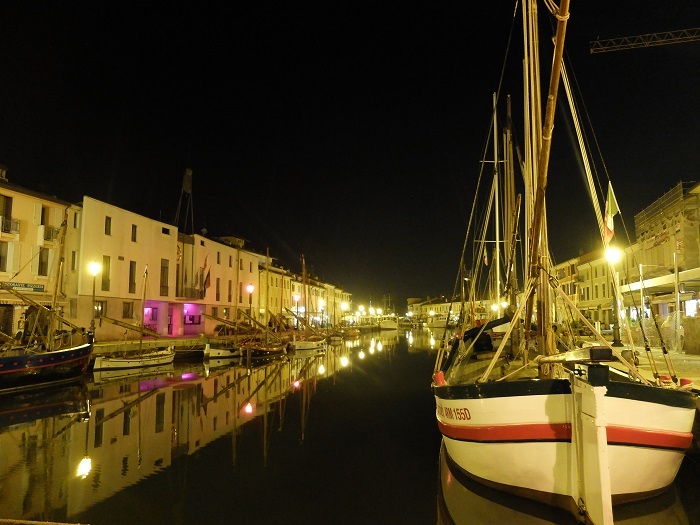 Especially after being away at an International travel blogger conference, TBD-Italy (a project by TTG Italia) for a few days in the charming town of Cesenatico and Rimini. Though I was absolutely exhausted after speaking two-languages for 14 hours a day. uckily for me, I was able to hitch a ride back to Florence earlier than planned yesterday with a fellow blogger, another girl in florence you should know about. As soon as I stepped back into Florence, the amount of people and humidity hit me with a (sort of pleasant) slap in the face. 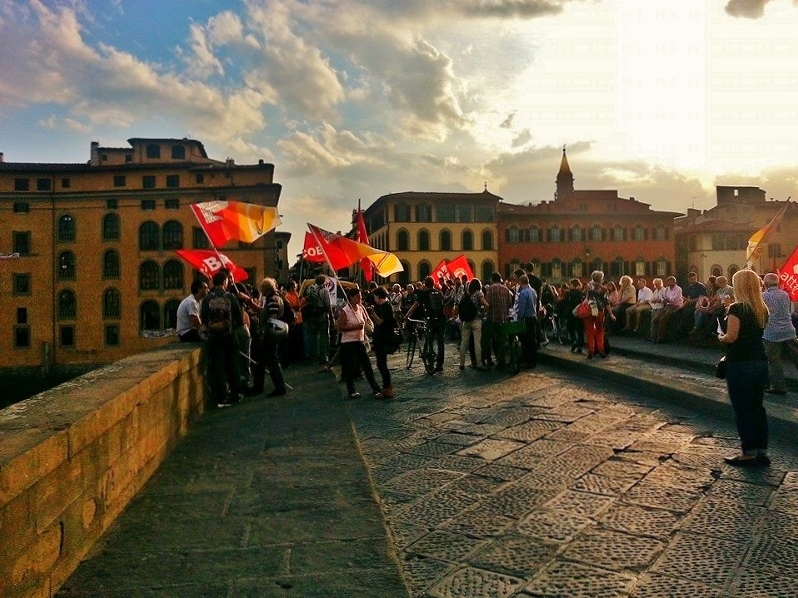 As we crossed Ponte Santa Trinita towards our home, we ran into the Italian communist party having an open concert on the bridge. While I definitely wouldn’t say we agree on a lot of things politically (but some we do) it was a fun scene to return home to. Think what you want about the community party but here they were clearly a lively bunch. Of course October is one of those periods that has me barely seeing my boyfriend Nico, with the combination of this conference, him going to France this next week for work and me going to meet my Italy Magazine team members in Sicily at the end of the month, we grab any chance to have a date night when we can. Let’s just say I am very thankful for apps like whatsapp and skype, I am constantly sending him random videos of Ginger’s hilariousness during the day (yep I am one of ‘those’ people) or writing really terrible French. We decided to go out to dinner to a new place we’d never been with drinks to start. One of the advantages of living in the historical center of town is that you can walk to almost all of your destinations. Florence is the kind of city best served on a slow platter, wandering down its historical alleyways is aesthetic, just try and ignore the smell at times. 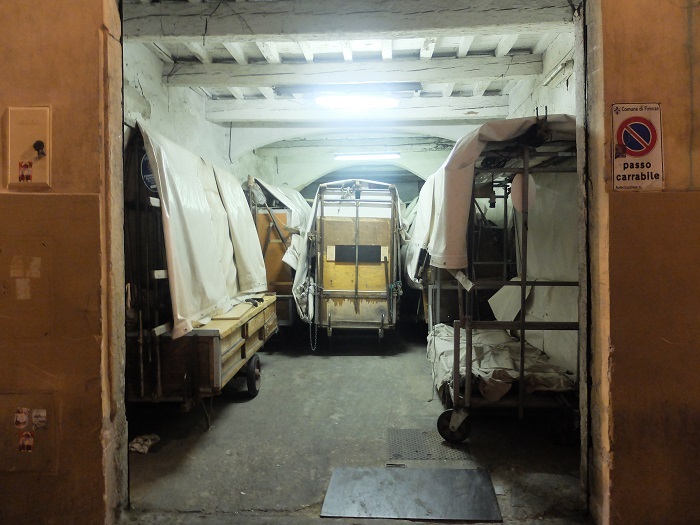 Ever wonder where Florentine street carts go to sleep? I did too! Nico is reading Dan Brown’s Inferno at the moment, which features Florence, so we often stop to look/point out scenes or plaques that Dan mentions in the book. Has anyone else done that? As we searched the Baptistery doors for yet another Inferno shout-out I spotted what looked like a really fancy photo shoot going on in front of the Duomo. We locals are privy to many newlyweds taking their wedding shots in front of iconic places around town but this particular couple stood out for the absolutely incredible blue and gold dress, fanning onto the cobblestones. Beautiful! Our watering hole for a drink before dinner was a very cool bar called, Sabor Cubano, located on a tiny street in the San Lorenzo neighborhood. This place is a real find, small intimate interior covered in mementos from Cuba serving up a small selection of very good cocktails. 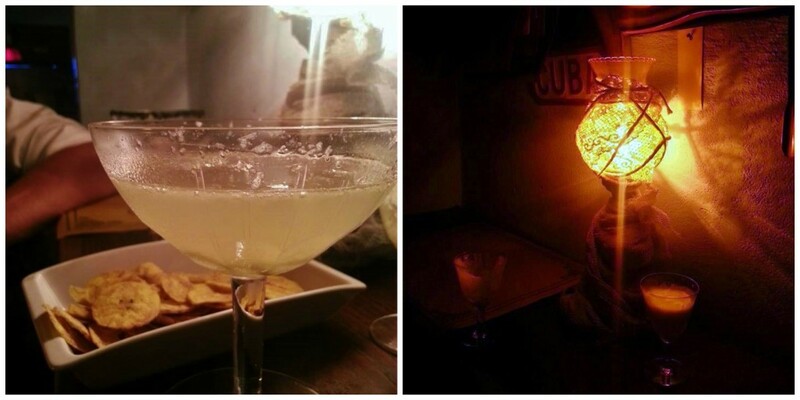 As I sat on my saddle seat, we sipped on fresh margaritas (on the rocks of course) infused with grapefuit juice, our vintage glasses covered in black salt. Better adapted to couples or a small group of friends, I have to say this is one of my favorite places in the city. For both atmosphere and drinks. Apparently they want to start cooking classes featuring Cuban food so if/when that happens, I will let you all know. Their cocktails are a refreshing 5 euros a drink and instead of serving up every drink under the sun, they smartly specialize in a few. I fell in love even more with this place when they served us cripy, hot plantain chips that we devoured faster than you can say ‘ho fame’. When I went to ask how to make these at home, the owner reached into a big bowl of fruit and handed me four plantains to take home and try for myself. How cool is that? 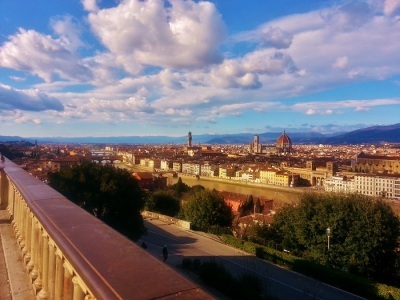 That is just the kind of things that do actually happen in a city like Florence. 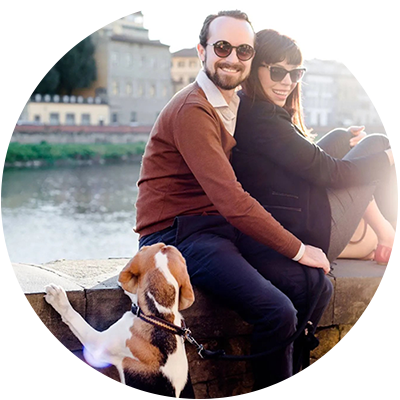 Plenty of people might have their opinions about Florentines but just look a little further, stop with the preconceived notions, and you would be quite surprised at how warm people really can be in this Renaissance city. Dinner was supposed to happen at La Giostra, which I am well aware is a tourist hotspot in town. I always wanted to see how it really was so we booked a late table at 9:30pm, which is a pretty normal time to have dinner on a Saturday night here. People were spilled out into the pavement waiting for tables and we fought out way to the front to tell them we had arrived. Apparently this didn’t matter because the front hostess disappeared and we waited for over a half hour with a ton of other people as the skies opened a rainstorm naturally decided to happen at that very moment. 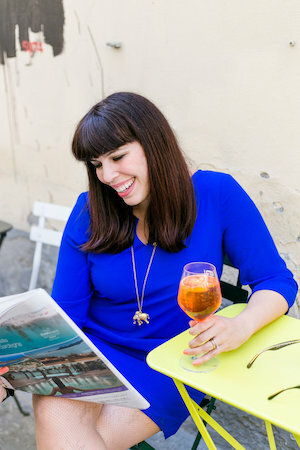 We spotted the wine list which was almost eye-popping expensive and finally decided to skip this place and try another restaurant that I’ve had my eyes on, Trattoria Acquacotta on via del pilastri. We ended up making a great decision. 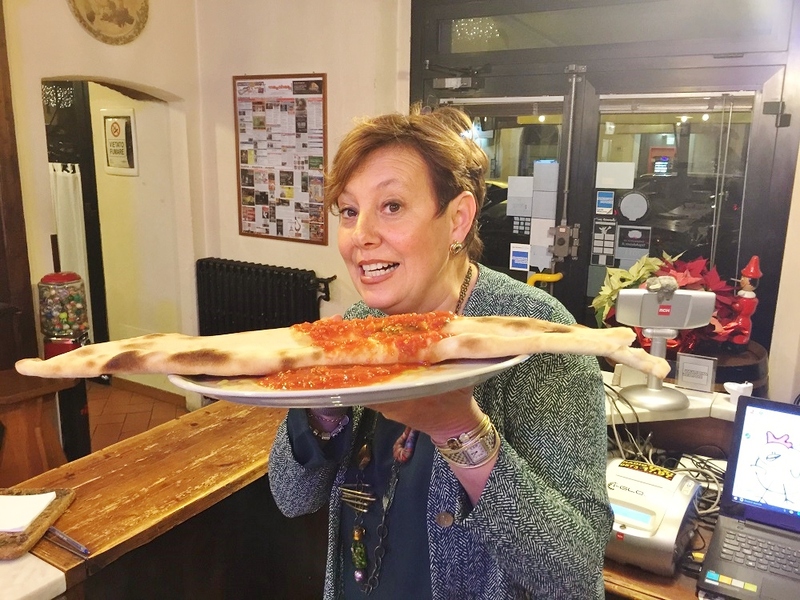 Very rustic and filled with people, we were lucky to grab a table and seek refuge from the rain, the atmosphere was friendly and much less chaotic and rushed than Giostra. Next to us was an empty table with two red roses sitting on either side and our waitress told us she actually went out and bought them on request for a reservation and they ended up being a no-show. Sweet of her to actually go ahead and do that even if the people never showed up. After ordering our (decently-priced rosso di montalcino) I headed to the bathroom and spotted a woman crying in the bathroom. Always a very awkward experience when you feel bad just trying to do your duty while someone is hysterical in the only tiny space there is to wash your hands. I couldn’t understand what language she was speaking but I really wanted to reach out give her a hug, thankfully eventually another woman came in to talk with her that she could actually understand. Later we found out (from our waitress who quickly became our ‘bestie’) that she was only 33 years old and marrying a man who was 69, the wedding party was staying at the nearby Four Seasons hotel. No comment but I think I now ‘get’ why she was crying. yikes! 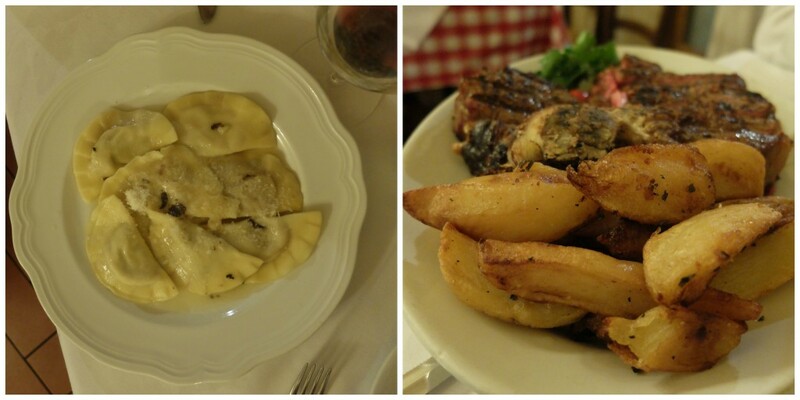 We ordered our food, a beautiful pheasant ravioli with black truffle cream and Florentine steak (bistecca alla fiorentina) with roasted potatoes. I was very impressed with both dishes, the ravioli flavorful and delicate, while our steak the perfect rare without being ‘raw’. I am always happy to find a fun place in the center that serves a decent bistecca, especially at a place that sort of looks like your grandmother’s house. We ended our night with two strong espresso coffees and a long walk home, appreciated as always what any night brings in the city. The discovery of a new place you can add to your ‘must-try’ and great company mixed in with a dash of drama, Firenze sei sempre casa mia! Sabor Cubano cocktail bar, cuban flair and wonderful drinks, I highly recommend the mojitos and margaritas with grapefruit juice. 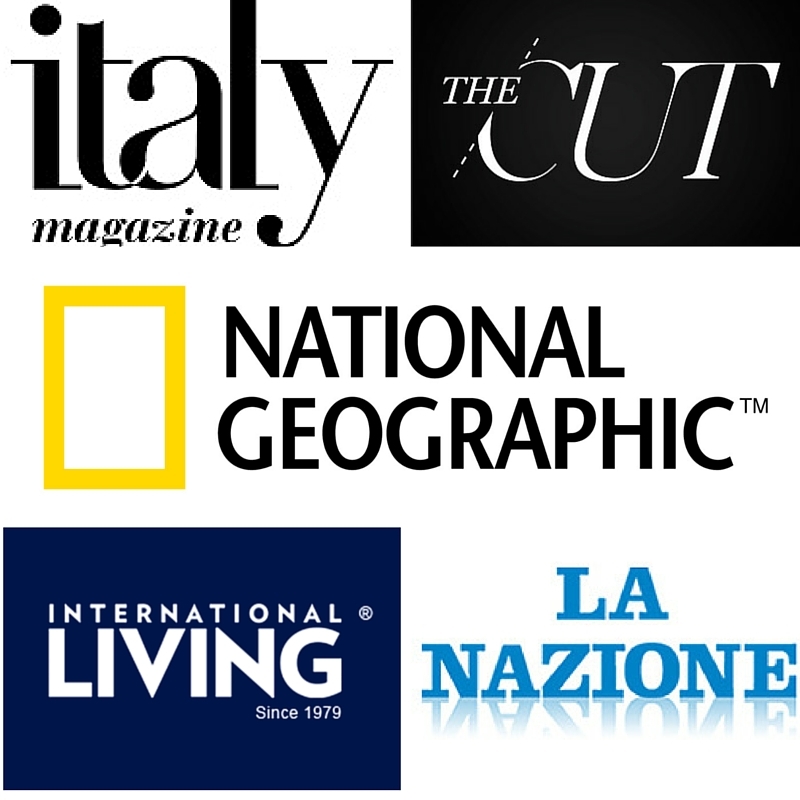 Address: Via Taddea 13/r, 50123 Florence, Italy. 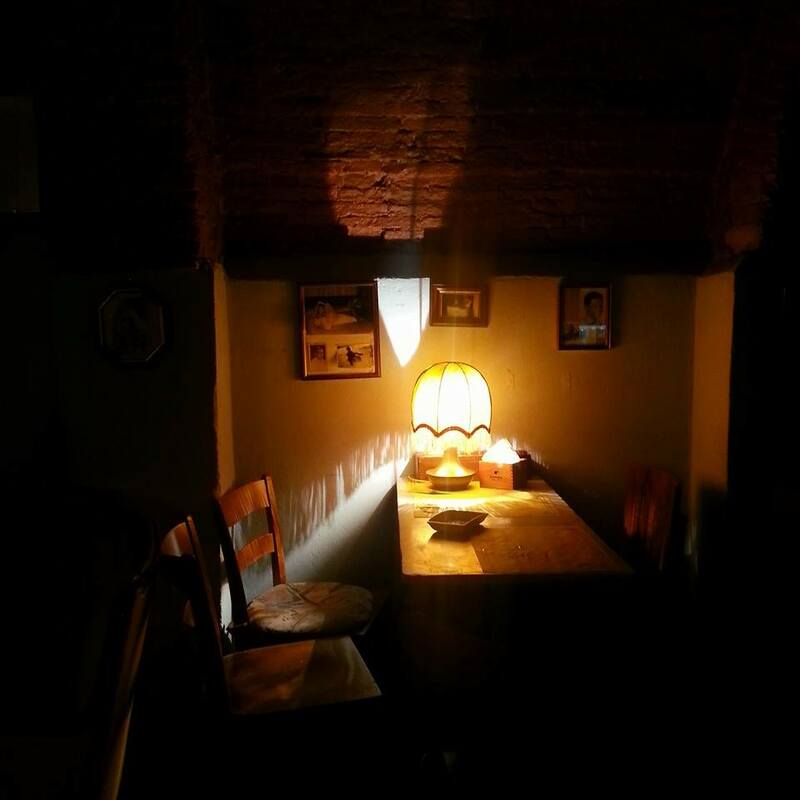 Trattoria Acquacotta, rustic Tuscan food and you just find someone crying in the bathroom. Jokes aside their Florence steak, bistecca alla fiorentina, is a winner. address: Via dei Pilastri, 51-red. Reservations highly recommended. Georgette, Ironically like Nico I am reading Inferno which I picked up in paperback at Frankfurt airport on my way in – just seemed apt for Florence! You should do a post on the spots with your’s and Nico’s own twist/photography! For my next visit would be a fun self-guided walk to do. Also, for your next date night check out Olio & Convivum which I stumbled upon on Via Santo Spirito – taking my husband there tonight. I found the truffle pasta (they shave the truffles table side) just divine – plus a beautiful intimate atmosphere and attentive service. Next visit I would love to say hello in person! Ciao! Hello Aassia! Nico is enjoying the book and being here just makes searching for items mentioned in the novel even more fum. I haven’t read it yet but I plan to download it on my kindle as soon as I’m done with a few books I’m reading. I was thinking about doing a self Dan Brown’s Inferno our with him, would be a lot of fun! I always walk by Olio & Convivum because it is very close to my house but have yet to eat or drink there. Sounds like I need to make it a stop on my list, there are almost too many great place in this area. 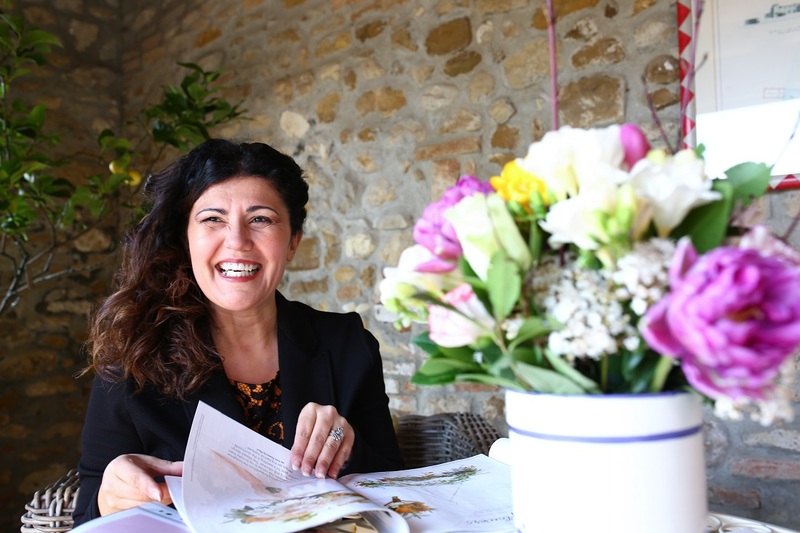 Do let me know the next time you come visit Bella Firenze! It sounds like you had a nice romantic night-rainstorm and all! The roses must have been a nice touch too! It’s good to keep romance in your routine, work and busy lives often mess with that. Ciao Cindy, it was a very romantic night and you are so right. We are very busy, especially in this period and connecting over what was a very random night was perfect. Plus I love how easygoing so many of these bar/restaurant owners are, we felt part of the family. Aw, I so wish I would’ve known about that Cuban place when we went to Florence! Do they serve any Cuban food or just drinks? Either way I would kill for some of those plantain chips (in Miami they’re called mariquitas)! Looks like you had fun, thanks for the share, hopefully we’ll be able to check it out next time we’re in Florence! I have been there before but yesterday really inspired me to write about it. They want to serve Cuban food as well and do cooking classes, I’m sure if you go in next time you’re in town, they will let you know. The plantain chips were spot on, that perfect salty crispyness plus he gave me a few of them to try at home as well, now that is service! Thanks, Georgette. 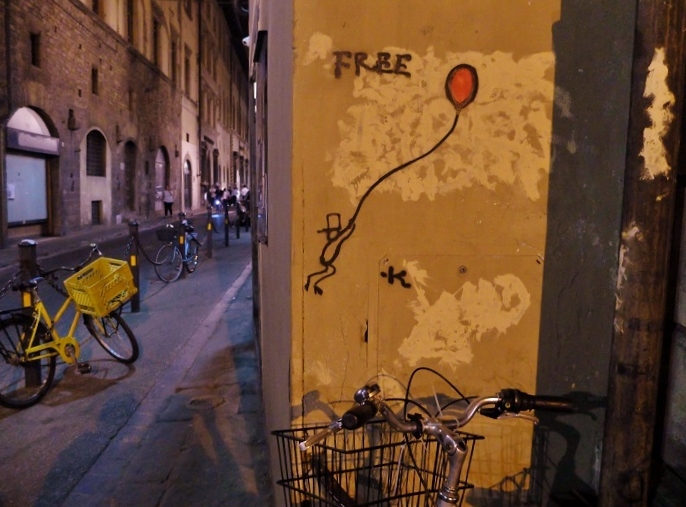 I love your writings and photos all these places in Florence, they are really insightful and add more to our life here in the city! We’ll give Trattoria Acquacotta a try, it’s not too far from our apartment. I second Olio & Convivium! Vicki and I really enjoyed our dinner there—great menu and outstanding wine.